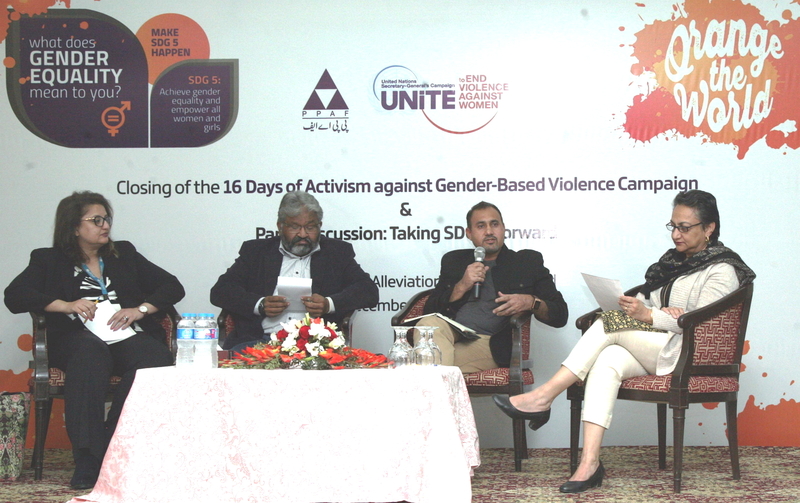 ISLAMABAD: Pakistan Poverty Alleviation Fund (PPAF) marked the closing of 16 Days of Activism against Gender-Based Violence and held a panel discussion on taking SDG 5 forward. Experts from prominent organisations reflected on how to drive action in Pakistan on the 5th Sustainable Development Goal which is to achieve gender equality and empower all women and girls. PPAF has been hosting 16 days of Activism against Gender-Based Violence for four years and the organisation has come up with various initiatives for raising awareness, supporting gender equality and engaging people to talk about the harmful effects of violence against women and girls. The panelists included Ms. Simi Kamal who is senior group head grants and operations at PPAF, Mr. Ghulam Mustafa Executive Director at the Farmers Development Organisation, Ms. Muqadissa Mehreen Child Protection Specialist at UNICEF and Mr. Azhar Hafeez, IT Manager at PTV Home. Ms. Mehreen quoted 2015 report which valued the unpaid work women do globally at $10 trillion and called for more recognition for unpaid women, adding that 78pc of women in Pakistan do not work. She urged government and non-government organisations to invest in the economic empowerment of women and to establish more vocational training centres across the country for them. Ms. Simi Kamal, who chaired the discussion, highlighted the fact that not all provinces of Pakistan have formulated or passed laws for the protection of women and urged legislators to play their due roles in supporting and enacting such laws. PPAF recognizes the critical need to empower women as active participants in the development process and is working on equal inclusion of women in 130 districts across Pakistan through its partner organizations. PPAF is committed to bringing empowerment and improving representation of women in its internal processes and external programmes and operations. PPAF believes that the country’s gender gaps can only be met with a conscious mandate of inclusion, and in the active participation and leadership of women within the organization, through its partner organizations and in the communities PPAF works for. From 25 November, the International Day for the Elimination of Violence against Women, to 10 December, Human Rights Day, the 16 Days of Activism against Gender-Based Violence Campaign is a time to take affirmative action to end violence against women and girls around the world. The international campaign originated from the first Women's Global Leadership Institute coordinated by the Center for Women's Global Leadership in 1991.